Many thanks for your interest in this piece of handmade jewellery by designer Liese Redstone . This fantastic piece is made up of lovely round white 5-6mm freshwater cultured pearls alternated by 5-6mm lapis lazuli real beads and a 9ct Gold hallmarked clasp. The clasp is made of 14ct Gold and it is hallmarked. Our pearls are all quality real river freshwater cultured (grown from a grain of sand in a mussel) , they are not sprayed or altered in any way , they are a natural product. They are naturally iridescent with a superb lustre. We import direct from suppliers overseas. 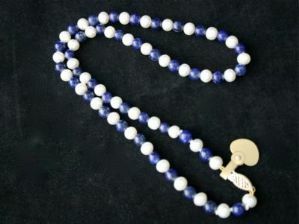 This pearl necklace is hand strung using high quality silk . This photos you see here are of the actual item that you could purchase. All our gold is either 9 or 14ct hallmarked. All our Silver is 925 hallmarked. These markings are as per the London Assay office stipulations. Most necklaces can have their length altered if you wish , this will come at extra cost based on the length required and time taken to make the adjustments. Please contact us through ebay or phone to discuss your requirements. Pearl River Trading is a member of the Charity Fairs Association (CFA) and attends many events up and down the country every month. We have had 99.1% positive feedback to date. Detailed seller ratings over last 12 months equal 4.9 Average out of 5. 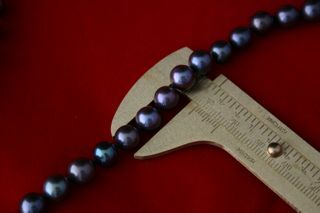 We will send every item in a presentation pouch with care guide instructions for your lovely new pearls. Re-stringing of your old , heirloom or well-loved necklaces ;once you have contacted us , send your necklace and I will phone you back with an estimated price. I will always endeavour to either make the repair or redesign and return the item within 7 working days. Pearl River Trading is run by Liese Redstone. Liese specialises in freshwater pearl jewellery using only the best quality pearls and semi-precious gemstones, set in hallmarked 14ct or 9ct gold or sterling silver. Pearls evoke purity, sophistication and elegance and designs range from the traditional string of pearls to bespoke pieces of a more individual style. Liese's range encompasses earrings, bracelets and necklaces and a restringing service is also available for well-loved or heirloom pearls. Beautiful pieces at surprisingly reasonable prices - give us a try for that special and everlasting gift. Want a individual piece made to order ? just call me today ! Cannot see what you want ? please just call us or email ! © Copyright Pearl River Trading - Pearl Necklaces and Earrings All rights reserved.